What Are the Dangers of Propane Gas? Propane is a gas used in homes for central heat and gas logs as well as for cooking on grills and other applications. While many people use this highly effective fuel, it has some built-in dangers that anyone using propane equipment should be aware of. Injury and death can result from the improper use of propane, and being aware of potential dangers associated with the volatile gas could save lives. Propane is a fuel commonly used in the home for many purposes. For propane to burn effectively, the oxygen-to-gas mixture must be within a certain range. For ideal conditions, there should be four parts propane to 96 parts oxygen. When the gas burns outside of these parameters, the result is incomplete combustion; this produces excessive carbon monoxide. This can be very dangerous if the space does not have proper ventilation. Carbon monoxide poisoning can result in death, as the toxic gas replaces the oxygen in the bloodstream. 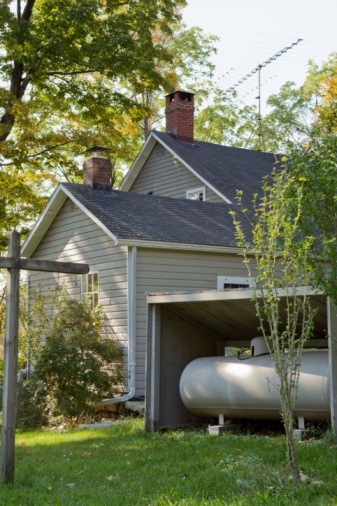 For this reason, it is important to have a carbon monoxide sensor installed near the propane equipment indoors to prevent this colorless and odorless gas from harming you or your family. According to the Propane 101 website, carbon monoxide poisoning causes 25 percent of propane-related deaths. As a fuel that is burned for various purposes, it is no surprise that propane is highly flammable. The buildup of propane in an enclosed space can be ignited by the smallest spark and cause an explosion and fire that could injure or kill those nearby. Propane is combined with a leak detection chemical that gives off a foul odor so that people will recognize when the gas is accumulating in the room. If you smell gas, make sure there are no lit cigarettes or other sources of fire in the area, and leave the premises. If you know the immediate source of the gas and you are able to shut it off, do so immediately, and then open windows or doors to let the gas escape. Propane is pumped into tanks in liquid form, and it comes out in gas form as fuel for burning in most home uses. The contents of a propane tank are under extreme pressure. A ruptured tank could cause an explosion. For this reason, it is important to check your propane tank for dents, rust or other damage to decrease the chance of a ruptured tank. Even if propane is not ignited, the buildup of the gas can be deadly due to inhalation. Breathing the gas can cause hypoxia, which is a form of oxygen deprivation that can lead to death. According to The American Journal of Forensic Medicine and Pathology, there have even been cases of people dying from intentionally breathing propane fumes, or "huffing." What Causes Black Soot From a Propane Fireplace? How Does Cold Affect Propane Tanks?